Both Batman and Lord of the Rings are getting board games this fall, with awesome microfig line-ups sure to please fans. Those two sets mark the end of our licensed set coverage however, since the few new Superhero sets were under a photo embargo and TMNT had nothing new to report on unfortunately. 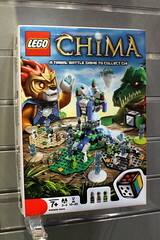 We do have more coverage of Lego's original themes coming up tonight, as well as this board game that's part of the new Chima line. The anthropomorphic characters don't work quite as well with printed faces alone, but it still looks fun and has some interesting parts for a decent price so it might be worth looking in to. Sooo getting the Batman game. Photo embargo on SH sets? NOOOOOOO! Can you guys please remember things about the Man of Steel sets we have had leaked box pics of? 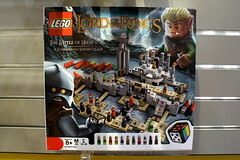 I wanna know minfig variations and what the sets include, mainly the Samllville set. As far as the Superman sets... I didn't get a good look at them and I'm not following the movie too closely so I have nothing helpful to report. I saw some knobbly looking grey flying vehicle, I think, and some guys that looked more at home in Star Wars than I would expect to be in that area. I'm sorry for being useless here. Comics are not my forte. It's okay, did one of the Super heroes have a farm type build and was it named Smallville? I don't think so no. I did not notice anything overtly farm like or the title Smallville. Pretty sure it was all for the upcoming movie. The Smallville set focused on the big grey ship. The desing was ok, but what stood out to me was the use of two of the oval canopies in dark bley giving it a bubbly shape. It looked like the same Zod in each set, but the two larger sets had armour that reminded me of the troopers fromthe TOR set and he had a cape in both iirc. The Black Zero set had Lois Lane and I think she looks really good, reminded me of Amy Adams right off. The rest of the figs were basically Kryptonian Troopers. buriedbybricks wrote: The Smallville set focused on the big grey ship. The desing was ok, but what stood out to me was the use of two of the oval canopies in dark bley giving it a bubbly shape. I'm betting Supes is the same in all three sets. drmnez wrote: Sooo getting the Batman game. 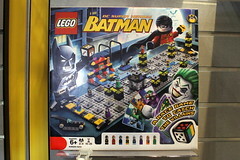 Yes, the Batman games looks really sweet! Might go for the LotR game too, depending on what the gameplay is like. These are some impressive microfigs. I love the little Uruks in Helm's Deep. What cute little bloodthirsty beasts they are.